This was yet another fantastic day out, after so many already this holiday. We'd booked this boat trip with Torridon Sea Tours, somewhat on a whim, encouraged by hearty recommendation from Jo at Torridon Stores. We don't want this to sound like we're being paid by the company to advertise them or something - we've no connections or anything, but credit where it's due - Torridon Seatours did us proud: we'd have been well impressed with that welcome and hospitality on land. How they did it on a small boat, we've no idea. It was a beautifully organised trip, and they were great to talk to. And we struck lucky in other ways, in spite of rather variable weather. The boat left from Shieldaig at 10 a.m., so we set off from Lochside Cottage on our bikes at about 7, to give ourselves plenty of time. Amazingly we didn't feel too bad after climbing Sgorr a Chadail and Mullach an Rathain the day before. It wasn't too strenuous a ride - reasonably quick (for us) with good views of the hills. We knew what to expect having done it on the way home last year. Today was a very different type of day: equally atmospheric in its own way, again remote, though sociable this time: dramatic weather - lowering rather than bright. 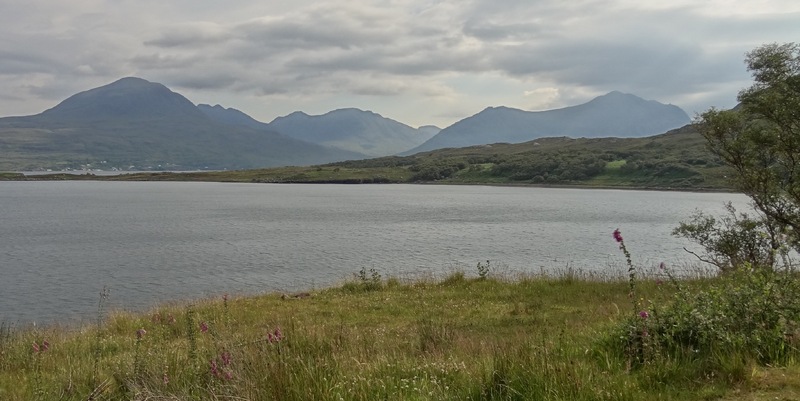 Beinn Alligin, Beinn Dearg, and Liathach, viewed from a little further up the Loch. 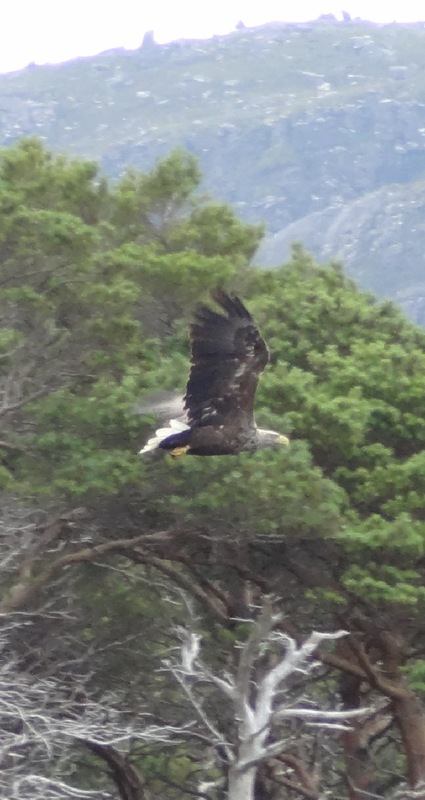 Not long into the trip we had our first great moment of the day - a sea eagle! Kenny and Gemma knew this bird well and said it was the female of a pair. Like so many people here, they know the wildlife intimately, as well as so much else. The eagle perched in a tree for a while - where we could see her - and flew off quite slowly. So we got a really good view of her - seeing her white tail quite clearly. What an exciting start to the day! We teased Gemma and Kenny later that they'd booked the eagle specially! It was the first time we'd ever seen one, in sixteen years of Highland holidays. Probably a once-in-a-lifetime sighting for us - certainly one that good. There were also black guillemots in the bay on the water - lovely birds. 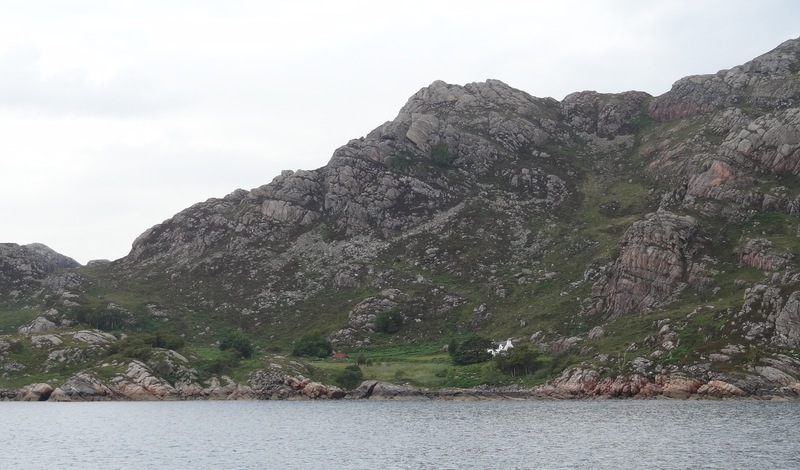 We stopped for a short while at the Aird Glas narrows (the boundary between Outer and Inner Loch Torridon). The tidal rip was clearly visible here. 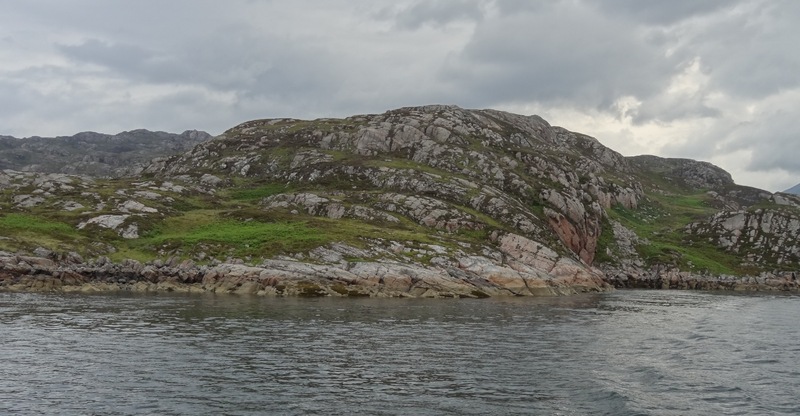 We then went off around the northern edge of the outer loch, with good views of the gneiss between Wester Alligin and Diabaig. This is spectacular - so precipitous and bumpy, with raised beaches, caves, veining, old crofts - incredibly isolated. Then the amazing sight of Diabaig. We really must try to get there next time we visit. We had a flying visit on a very fast post bus once, but in murky weather so we don't remember an awful lot from that apart from the speed! We followed the coast further out, past Craig. The English couple on the boat had recently walked from Diabaig to Craig and back, and found it tough though very rewarding. On the boat, we stopped to look at an island with Arctic Terns and another one with lots of seals. The seals were funny - on one side it was mainly young seals who didn't like the look of us. So they shuffled over the rock until some of them finally fell into the sea! 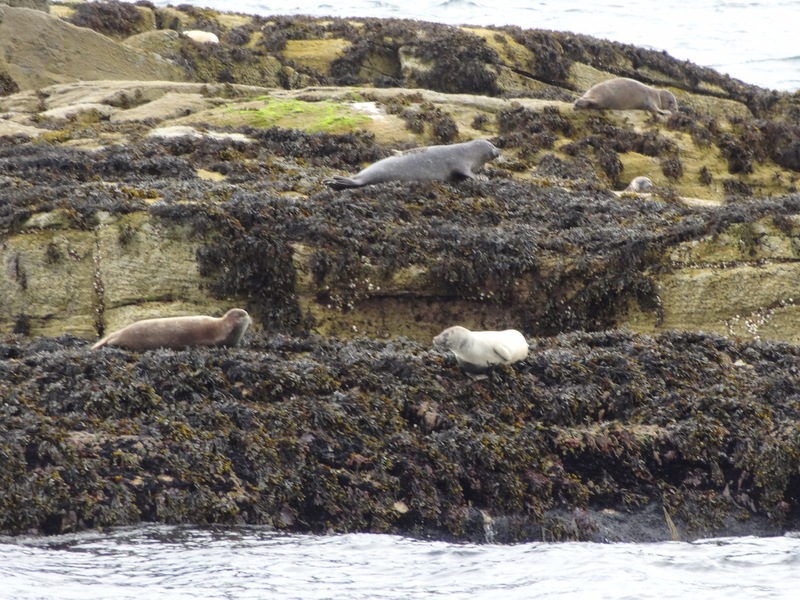 On the other side of the rocky island were older seals who couldn't care less, just stayed where they were and looked at us. 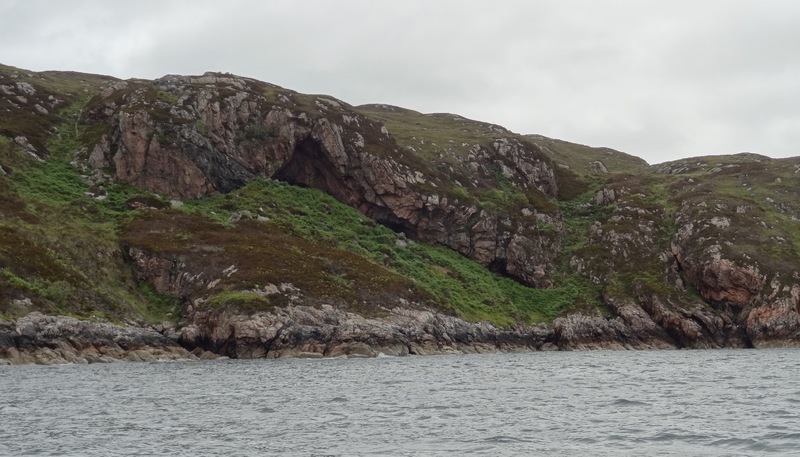 In places there were many sea caves: some of these are known to have been used for smuggling (i.e. illicit whisky distilling), which was a common activity in this very remote area. Murdoch MacDonald, the Alligin-born author who's written so evocatively about Torridon, has just published a very interesting little book about the history of smuggling in Wester Ross - it's available from local stores, e.g. Torridon Stores, the Beinn Eighe visitor centre, etc., or from Torridon Publishing in Evanton. One of the raised beaches, much clearer from the sea! Island with arctic terns. They were doing sudden group flying manoeuvres which were difficult to explain as they didn't seem to be either escaping or persuing. After that we zoomed off over the Inner Sound to get to Rona. It was a bit rougher out in the open. But the boat was so comfortable! 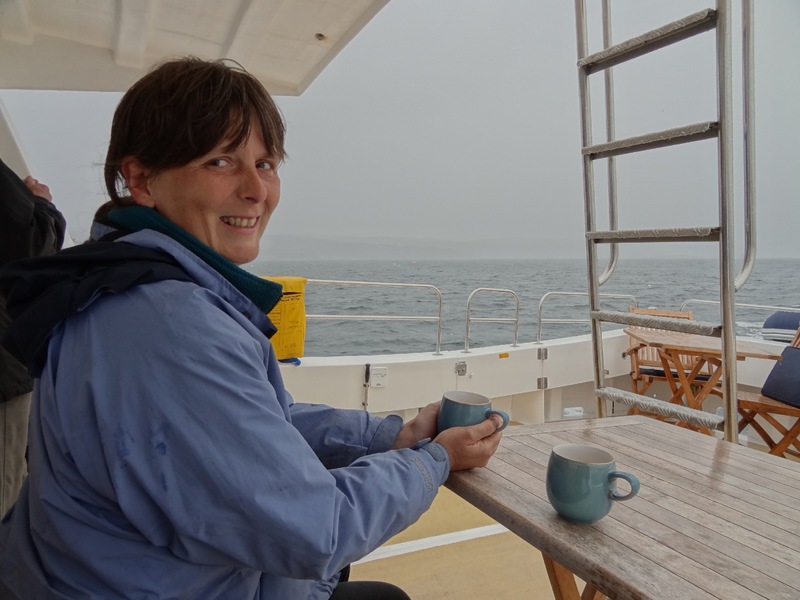 We sat on deck at tables and Gemma served us tea in Denby china mugs, and very tasty carrot cake! That's the way to travel! Sea spray flying over the top of us, protected by the front of the boat, looking back out at the open sea - bouncy but exciting rather than awkward - and very classy catering... We went round the north side of Rona past the lighthouse and down the coast. There were good views of the Trotternish Peninsula, though it was raining there by now. 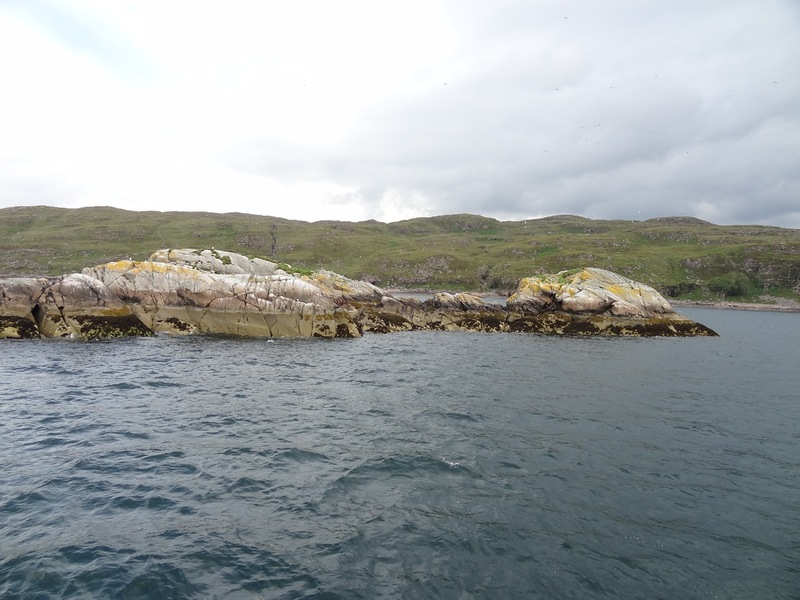 We turned into Acairseid Mhor, and moored against the pontoon in the harbour by the Warden's house and had 2 hours on shore to explore, fuelled by Gemma's home made tablet which was scrumptious. 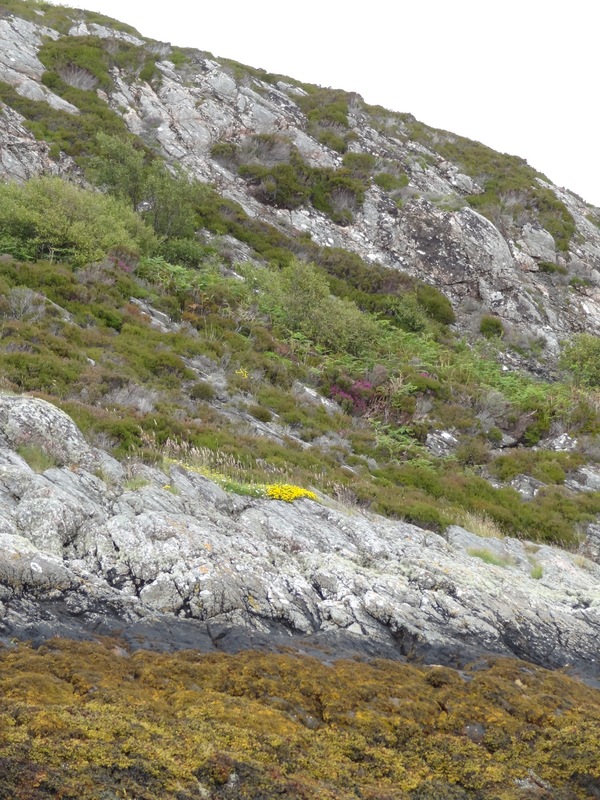 The island is almost completely gneiss and very knobbly. Impressive! Colours on the north end of Rona. 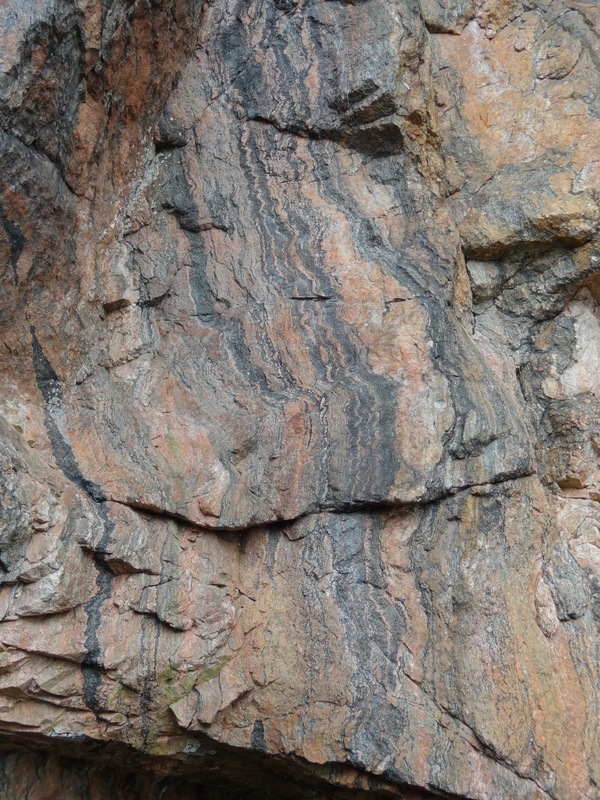 Here too the rock is Gneiss, but the colours are darker - mainly because of more varied (and one can imagine, harsher) weathering here. The "road" is a rough track that goes straight up the nobbles. The only permanent inhabitants are the warden (Bill) and his wife - both very sociable and good fun. There are also some holiday cottages. The lighthouse is, of course, automatic now. 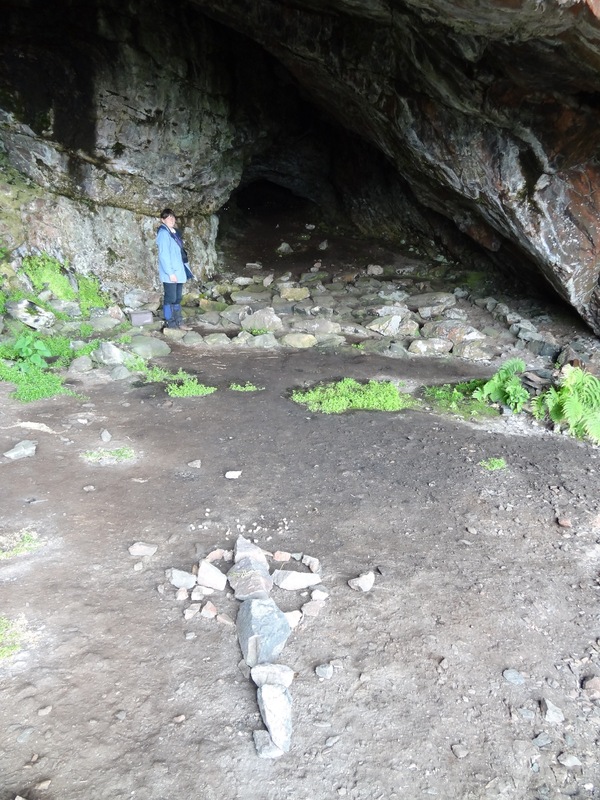 Gemma suggested some walks: towards the north of the island to a ruined cleared village, a short walk up to the highest point, or across the island to Church Cave. There were once several crofting communities on the island: as in so many places in the Highlands, these communities were either forcibly evicted, starved out, or they dwindled and left. We decided to go to Church Cave. A short, sharp climb up the track, then a boggy path across moorland, then a short, sharp drop down a cliff almost to sea level again. The Cave was impressive. A wide entrance, narrowing inside. There are rows of low stones - only about a foot high at most, for the congregation to sit on, and a wooden box containing a bible. An amazing spot. It was used as the island's church up until the 1930s. Quite a thought that: the drop down to the cave wasn't an easy one: steep, rough and rocky - we were very glad of the rope handrail that had been put there. There's no question of easy access from the sea either - it's pretty open, with no beach, and it's very precipitous and bouldery between the cave and the sea. A couple got married there last year, but they can only have had fit guests, and no high heels! 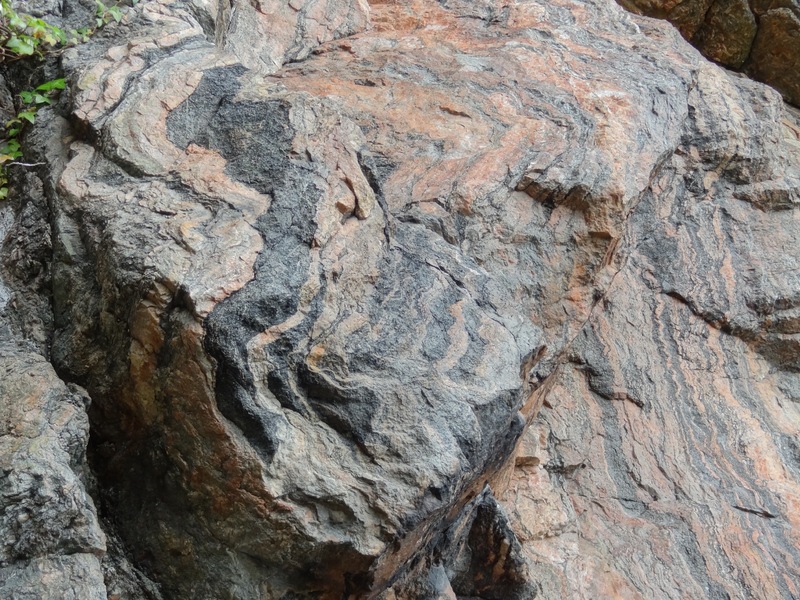 Physically it was also very impressive - the space of the cave, and the spectacular folds in the rock. But most of all the simplicity and dedication of the place. 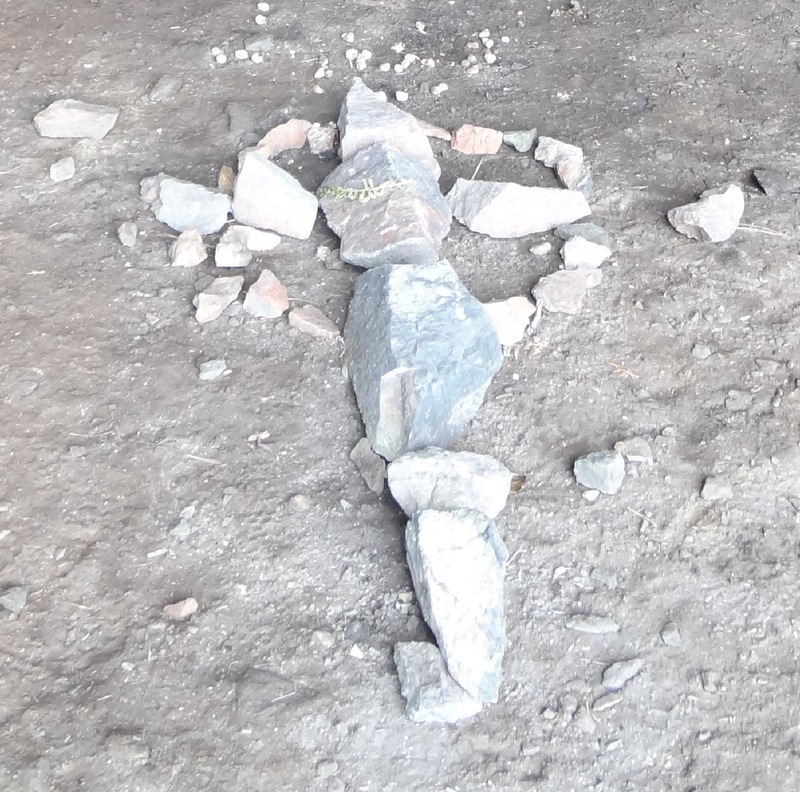 The cross at the front of the cave. On the right (centre) is the font, surrounded by bracken, which collects water dripping from the outside of the cave. ..and the same hills, with the Coulin forest, viewed from the track to the cave, near the main track. On our way back, we stopped at the Warden's house to buy some postcards and bits and pieces. Rona also produces its own stamps, though they'll only get letters as far as Portree! We posted some postcards on the island, anyway. We also bought some Rona-produced venison, and had a chat with Bill. He's obviously a character, and drives a quad-bike very fast along the tracks! Kenny teased him that he'd have driven it onto the boat if the pontoon stairs were wider! Bill used to work as a forester. He was saying that prevailing advice then was poor - narrowly advocating monoculture. For the last few years they've kept cattle on Rona to keep the scrub down and the land in good shape: this is also increasingly prevailing orthodoxy in land management at the moment. We saw it last year at Plockton, for example, and also our local Wildlife Trust, Yorkshire, do a lot of this. Bill said it hadn't really worked on Rona, though: the cattle had churned the land up too much and they were going to get rid of them. However, they'll keep the deer and continue to sell venison. He'd also met some interesting people who'd brought yachts into Rona, including some royalty. Back on the Seaflower it was lunchtime. The French family ate in the cabin, but we and the other couple sat on deck with some shelter. A beautiful spot with the harbour enclosing us. Lunch was very tasty, and very well presented. Proper china again, and real glasses for the white wine that was served! We had prawns (langoustine) in their shells (caught between Rona and the mainland), smoked salmon and smoked salmon steak (from the Torridon Smoke House). Delicious. Also there was bread and cherry tomatoes. The children were given some stuff to feed the crabs off the pontoon! 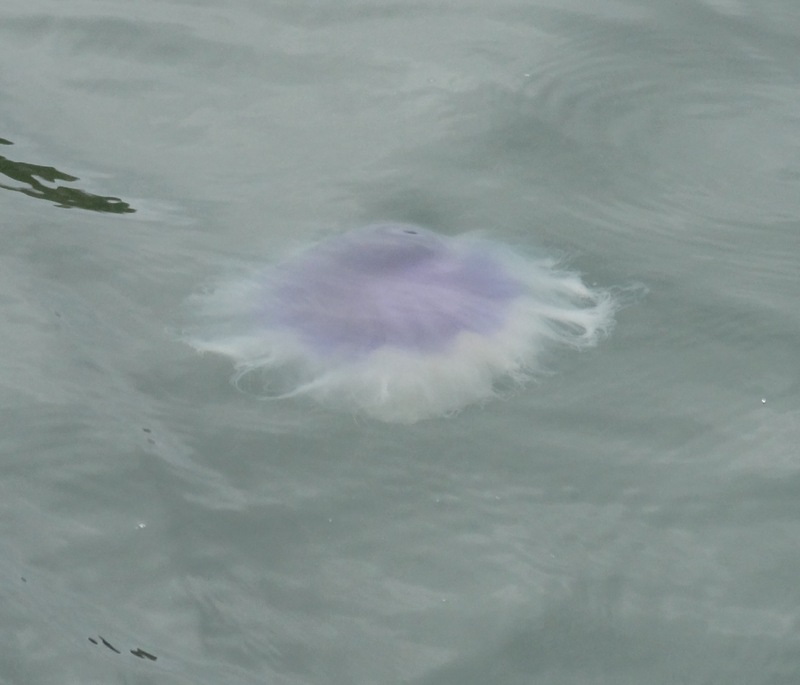 Someone spotted a very blue jellyfish which we all had a good look at, then the children had a good bit of a run around on the island before we set off again. Unfortunately the weather was starting to close in now. 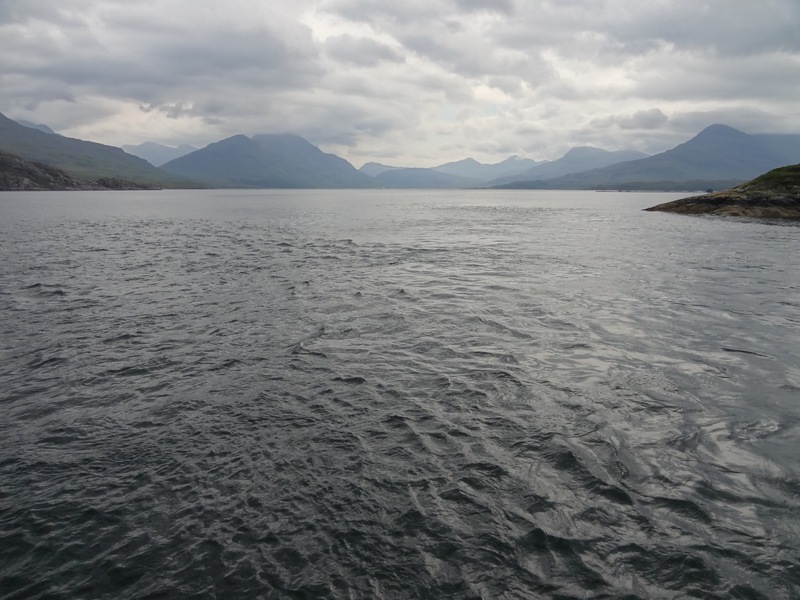 We couldn't see much of Skye, but sailed around the south of Rona and could see the rough and remote ends of Rona and Raasay. 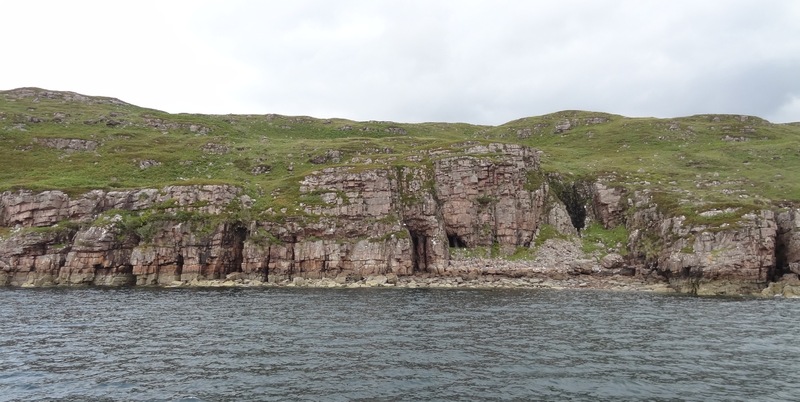 Very kindly they took the boat back up the east coast of Rona so we could all see Church Cave from the sea. 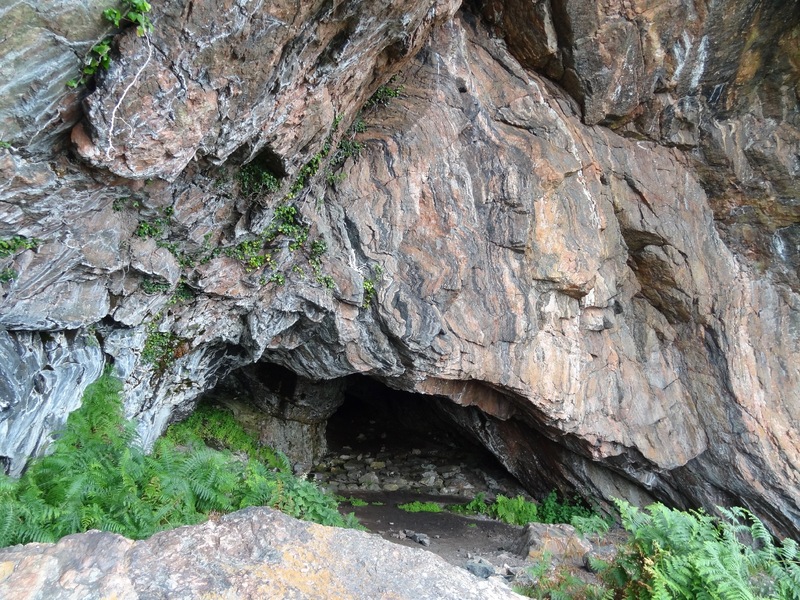 You can see the rope on the left of the cave, and how generally rough and steep the ground is. We were the only people in the group who'd visited the cave, and we enjoyed talking to the others a bit about the cave and pointing out some things for them. The mainland - Applecross Peninsula - had also disappeared. Gemma gave us more tea and homemade shortbread. 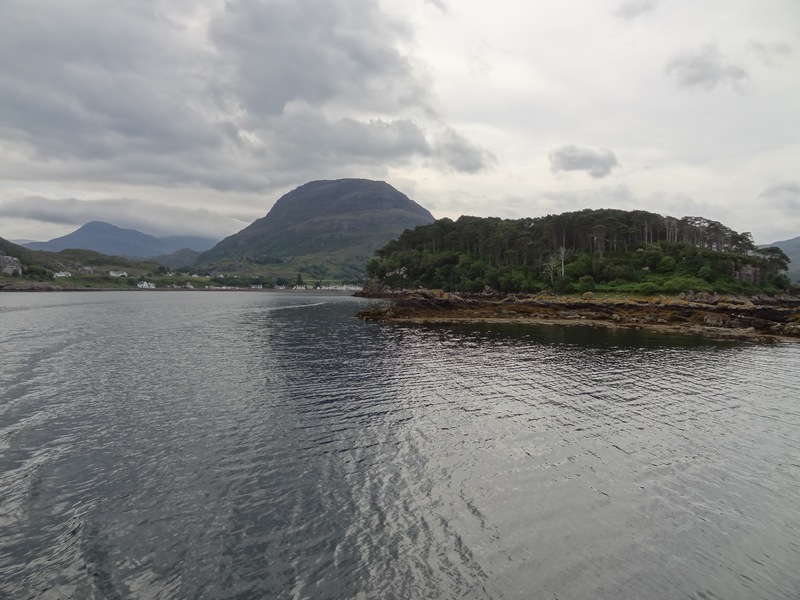 Then back to Shieldaig. We'd had a fantastic trip. They looked after us really well and really made an occasion out of the whole thing. When we saw Jo at Torridon Stores again the next day, she was really pleased to hear how impressed we had been. After getting off the dinghy from the Seaflower, we said our goodbyes, then retreated to a bus shelter to put on waterproofs and pack stuff into panniers for the cycle ride back to Lochside Cottage. We didn't get as wet as we expected, but the wind dropped so there were plenty of midges. Then, back at Lochside cottage, an enormous treat - we sat looking out of the dining room window, yet again - we could never tire of that vista over Loch Torridon - and noticed two shapes on the quiet loch. A bit more investigation showed that they were two otters fishing! We even braved the midges to watch them from outside, and were rewarded when both otters climbed up onto the jetty outside our cottage. Both otters then returned to the sea and we lost one of them, but were able to watch the other still fishing and swimming. We could even hear it crunching fish! Amazing! Also perhaps the best view we'll ever get of them - who knows? A fantastic end to a great day. Sorry we didn't manage to get a photo of the otters - the light was going, even though the weather was starting to lift. But it's worth saying that this part of the Loch is well known as being good for otters. We saw some round here last year, and back in 2000 on the way back from Beinn Alligin. 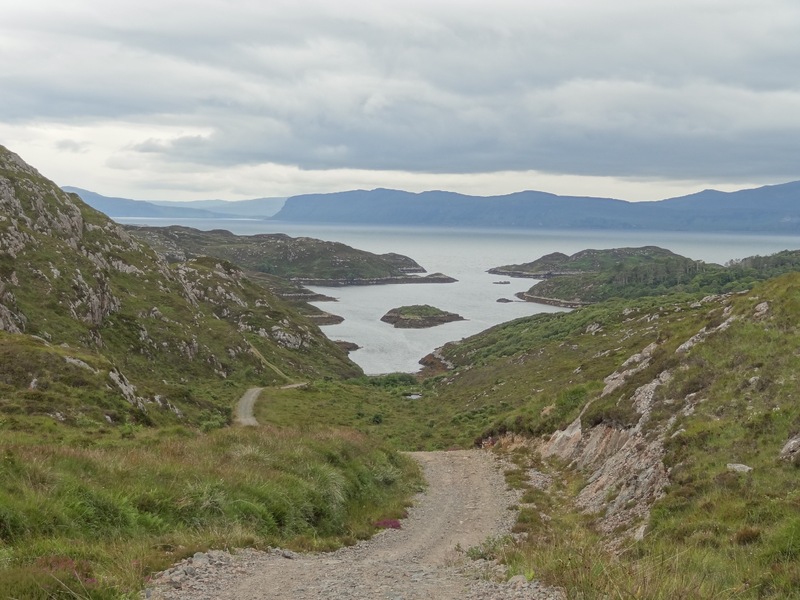 This includes the public road from the Torridon House Estate to Fasag, along the shore, but most especially the shore road on the Estate just after it branches off from the main Fasag-Alligin road. Walkers and cyclists are welcome here, and it's not far from the nearest parking spot on the public road - definitely worth a linger at dusk if you want to see them. 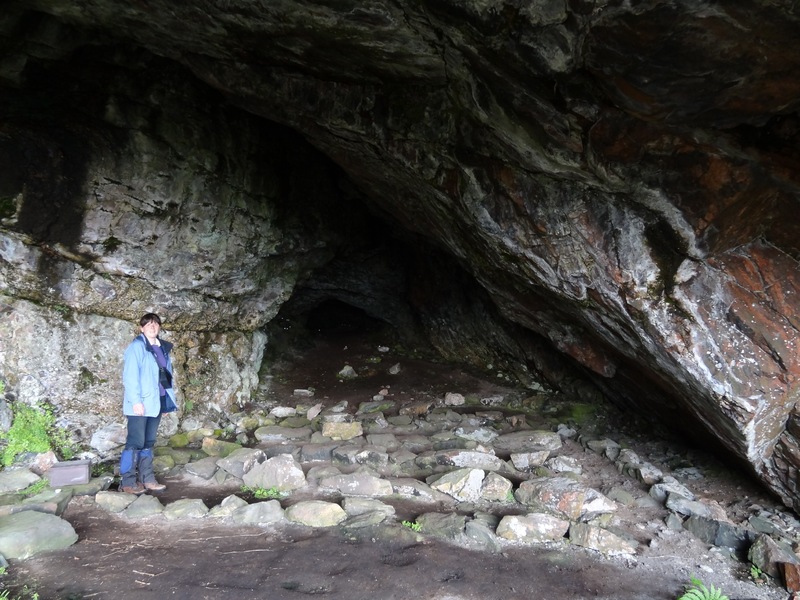 It was a great day out - two of our best wildlife experiences ever, and Church Cave - well, this was an extraordinary place: scarily remote and precipitous, but beautiful and humbling also. Many thanks to Gemma and Kenny in particular. 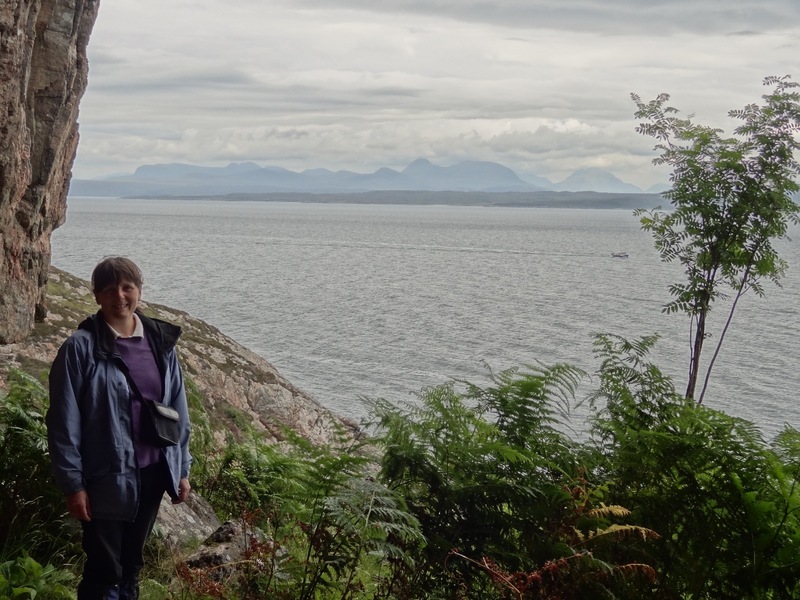 The north end of Raasay. (Text and photos by Daniel and Clare Gordon. October 2011).